Excitement filled the seats of Carnesecca Arena on April 6 as Greek Week drew to a close with the biggest event of them all: Lip Sync. Fourteen Greek organizations participated in the competition. The event is a combination of a dance show and talent showcase, according to Natalie Maio, associate director of leadership and has been a Greek tradition at St. John’s for over 10 years. What made Lip Sync so special this year, however, was location, location, location. The new venue allowed for upwards of 1,200 spectators to attend the event. 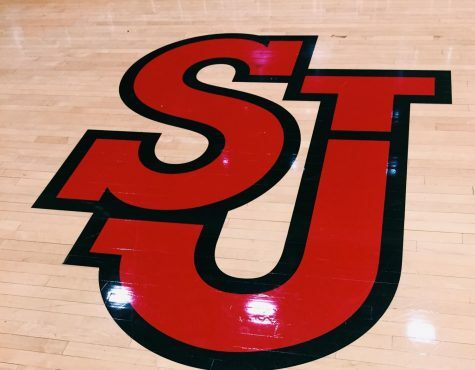 Vasco Lopes, president of the Inter-Fraternity Council, agreed that getting Carnesecca Arena was an important step, but also felt it was a big risk to take. During Lip Sync, each organization was given an eight-minute time limit in which to perform. They had to lip sync to the song or songs they selected and choreograph various combinations. All organizations were judged on lip sync ability, choreography and creativity, which sometimes included themes made up by the organizations. “What people don’t realize is that the routine is mostly based on the accuracy of lip sync,” said Amelia Barbagallo, president of the Panhellenic Council. Without a doubt, fresh material was at hand, from a “time warp” to a four seasons theme. Although themes aren’t necessary to enhance a group’s standing, each organization was exceptionally innovative. Humor, was also an “it” factor to keep the audience both captivated and guessing. Pi Lambda Phi, for example, wrapped up their performance with a take on the mambo scene from the film “Dirty Dancing.” Kappa Phi Beta, on the other hand, had a mischievous yet adorable concept, with their theme being heaven and hell. Even the judges, all directors and coordinators from the Department of Student Life at St. John’s, seemed to be enjoying themselves, dancing in between routines and grooving in their seats. At the end of the night, the results were Sigma Phi Epsilon and Phi Sigma Sigma as the winners of the Lip Sync competition. Second place winners were Pi Lambda Phi and Gamma Phi Beta; third place winners were Lambda Phi Epsilon and Theta Phi Alpha.